Epitaph, Labuan Memorial, Panel 18, Age 33. MOORE, Private, FRANK CLIFFORD, WX8076, A.I.F. 2/4 M.G. Bn., Australian Infantry. 12 September 1944. Age 33. 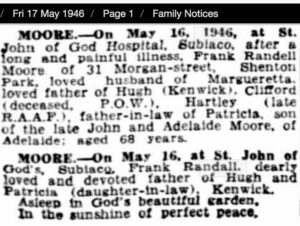 Son of Frank Randell Moore and Margueretta Valeria Moore, of Shenton Park, Western Australia. Panel 18. Frank’s parents Frank Randall born 1878 South Australia and Margueretta Valeria Agnes Bennett born 1882 Milicent South Australia, married 1907 in Northam. The Moore family initially lived at Wongan Hills. 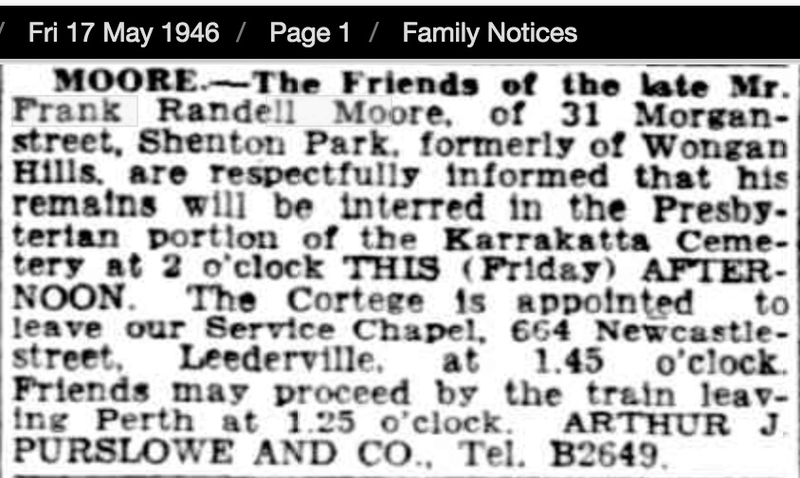 In 1936 Electoral Roll Frank and Margueretta are recorded residing in Narrogin, and his occupation was blacksmith. Shenton Park. 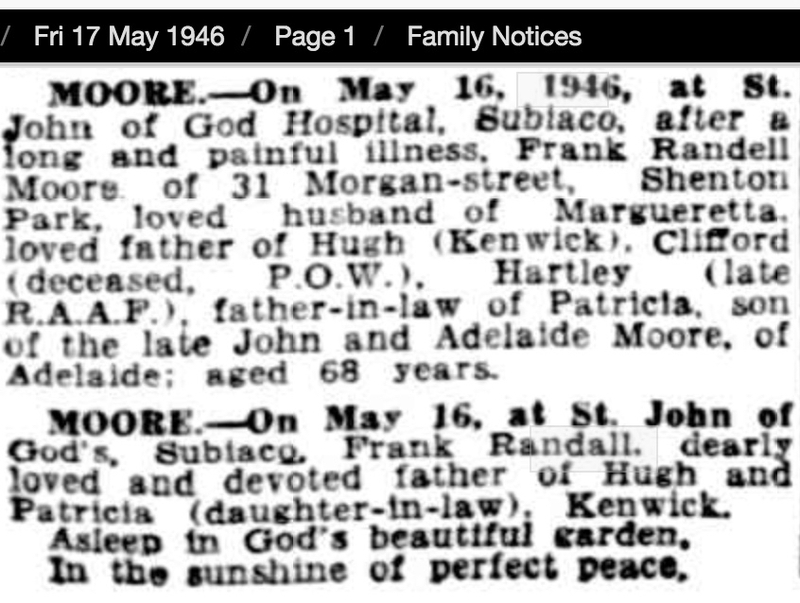 Margueretta Moore died March 1961, Kenwick. Both Frank (Snr) and Margueretta are both buried at Karrakatta. 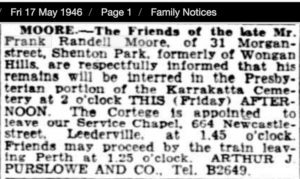 In 1936, 1937 and until he enlisted Frank Moore (Jnr) is recorded living at Waddy Forrest near Coorow, C/o M. Patton with his occupation given as farming/teamster. Unfortunately, there is very little known of Frank’s life prior to enlisting, other than he had two brothers and one sister. Frank was one of several Green Force No. 3 Battalion men who having survived the hardships, starvation and beatings on the Burma Thailand Railway was selected for Japan; and sailed on the ill-fated ‘Rakuyo Maru’, most POWs losing their lives when the ship sank in the South China Sea following a torpedo attack by American submarines September 1944.